Since the fall of 2008, the Federal Reserve System has pumped an almost incomprehensibly large amount of reserves into the commercial banking system—about $1.4 trillion. In normal circumstances, this action would have given rise to hyperinflation. Of course, not only has no hyperinflation occurred, but scarcely any inflation at all has occurred, and policy makers seem to have lost more sleep in worrying about deflation than about inflation. By this time, everyone knows that the hyperinflation did not occur primarily because the banks simply held onto the bloated reserve balances, rather than using them to extend new loans and make new investments. Whereas it used to be the case that increased reserves fairly quickly translated into increased money supply, in the past five years the money supply has increased only moderately and, in certain spells, hardly at all. Additional bank reserves, as such, are not available to the public for making expenditures; hence they have not provided fuel for the spending that would have driven prices up more or less across the board. 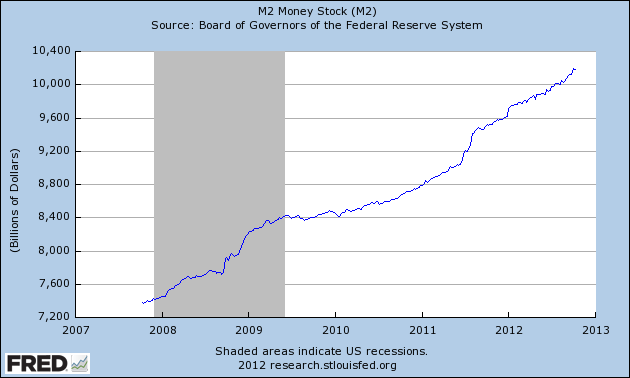 However, the money supply has increased somewhat. Indeed, by historical standards, its increase in the past five years—about 38 percent for the M2 measure of money—has been fairly brisk. Yet this increase failed to give rise to accelerated price inflation in large part because the public has chosen to increase the amount of cash it holds, rather than spends. 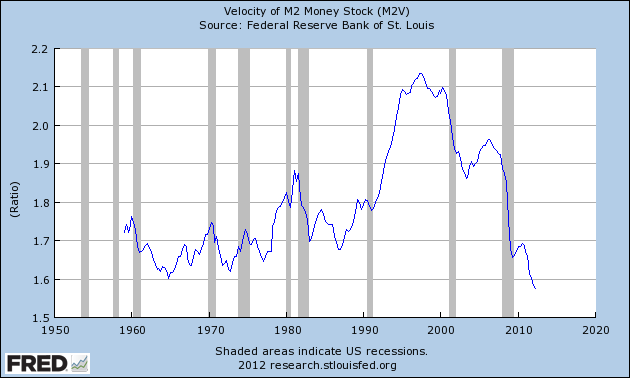 In technical economic jargon, the money stock’s velocity of circulation has fallen substantially—by about 18 percent in the past five years. The bulk of this decline occurred in 2008, when the financial debacle drove many individuals and firms to flee to the seemingly safest financial asset available amid the tempest of uncertainty—cash. 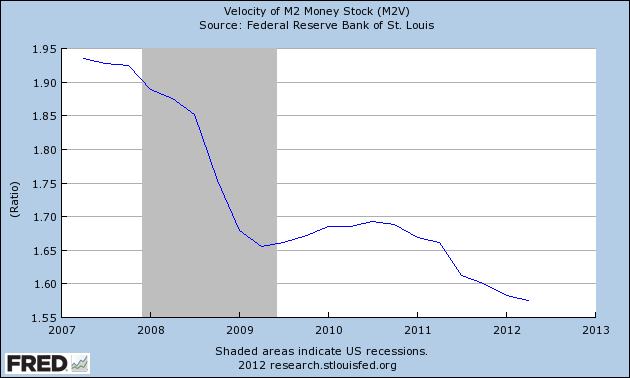 After the winter of 2009, the velocity of monetary circulation rose somewhat, but during the past two years, it has resumed its decline. It now stands at the lowest level recorded in more than fifty years. People ordinarily do not add to their cash balances (relative to their income) unless they believe that alternative assets will have lower risk-adjusted yields than cash. Because cash has a nominal yield of zero, the only way that holding it can have a positive real yield is if its purchasing power increases—that is, if people expect price deflation. Perhaps in the present situation, they have not so much expected deflation as they have considered the risks associated with alternative assets to be too great to compensate for their greater expected nominal yield. I do not claim to have the One True Solution to the puzzle of why the velocity of monetary circulation has fallen so far and, more puzzling to me, why it has not rebounded more from the collapse it experienced during 2008. We live, it seems, in a time of extraordinary apprehensions about the future. Financial, economic, and regime uncertainties abound. 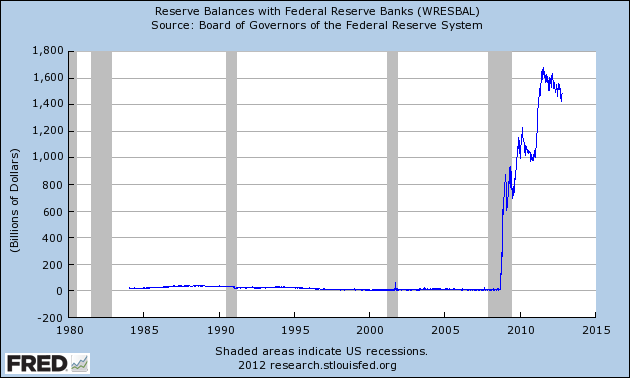 Although some people enjoy remarking that fiat money is “just paper” and hence “essentially worthless,” the public in general has viewed it in recent years as valuable, indeed, so much so that they have greatly increased their demand to hold it, and they continue to maintain and even to increase this extraordinary demand for the asset with a zero nominal yield. PreviousYou Gotta Check This One Out! Where Does the Money Go?